Happy Halloween! 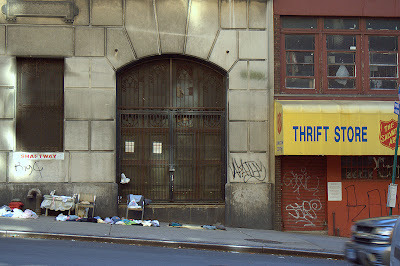 There could be ghosts on the second floor of this Salvation Army Thrift Store. This desolate spot is right off busy Broadway. The 96th Street subway stop, a major stop, is on the corner, and this is a reasonably prosperous part of town. And it was a beautiful Sunday afternoon. Okay, back to the beginning. I hope you've been paying attention. This past weekend, Lee was in town, visiting Luka and going to the peace march downtown on Saturday. On Sunday, the three of us met to have the outstanding brunch at Turkuaz, previously mentioned here. Afterwards, we parted, they off to the Neue Museum or maybe home for naps, and I to my photo walk. 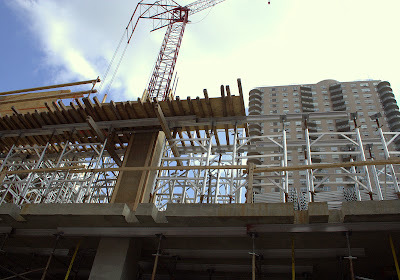 I walked down Broadway to 96th, didn't shoot much because I've done this before, but I did want to show you another high rise apartment building going up on Broadway. This will help to house the 1,000,000 new people Mayor Bloomberg hopes to persuade to move here. Update 11/2/07: Just stumbled across this relevant NY Times article. 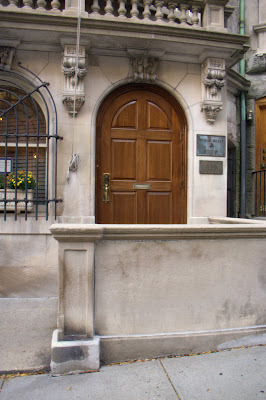 Here is the pretty doorway to the Nicholas Roerich Museum. I had never heard of it – had you? Roerich was a Russian painter who gained fame designing sets and costumes for Diaghilev and most famously, collaborated with Stravinsky on Le Sacre du Printemps. There's lots more; if you are interested, check out the museum link. So I walk in, and there are a couple of gents sitting around who direct me to the upper two floors. Paintings everywhere. On the second floor is a grand piano and a bunch of folding chairs set up for an audience. Pretty soon a woman sweeps in and begins rehearsing, playing Chopin, very accomplished. By this time I'm on the third floor, in the front room, all alone, with the light streaming in, colorful paintings all around, and gorgeous music from the piano below. See? Even a walk up West End Avenue can end in an enchanted place you never knew existed. They have concerts most Sunday afternoons at 5 o'clock. It's free (contributions accepted) and no reserved seating. If you get there before me, save me a seat. Then after that, as if that wasn't enough, when I got back to Broadway, I went into Starbucks, got a latte and got a seat by the window, no waiting. What a city! I'm going to start at the end of this walk because I want to tell it now. Sometimes there are walks that I decide to take, not because I think I'm going to get good or interesting photographs, but because it must be done. Every block must be walked whether or not it is interesting or beautiful. Today I took one of those walks. West End Avenue. Dull, dull, dull. One big apartment building after another, nothing commercial and no street life. The only reason it's not the dullest block in Manhattan (that honor falls to Fort Washington Avenue) is because the buildings are better looking than those on Ft. Washington and they have better details. At least it was a beautiful day. Gorgeous. After the rain of the last few days and the unreasonably warm days before that, this was a real Fall day: sunny and breezy and brisk. So I strolled along, starting at 96th Street, walking uptown to 106th, then turning and walking up Riverside, but giving that up after one block because the wind was so strong there, I was getting an earache. Turned back on 107th Street to go back to Broadway, and saw this pretty little building with a plaque on the side of the door. This, my friends, is the Nicholas Roerich Museum. And this post is too long as it is, so I will continue tomorrow. The rain having continued until late this afternoon, I offer you this photograph taken one year ago to the day. October 27, 2006 was a Friday night and after work I went downtown to have dinner with a friend. I had excess photos a year ago, so this one never was posted even though I have a sentimental attachment to Village Cigars. Years ago before I moved here, when I was still married, I came to New York by myself to stay with a college friend whom you may now know as Luka. Her apartment was sure romantic to this gal from Illinois. Actually, it was to her, too. It was on Christopher Street which was busy and filled with gay men in leather but when you closed the door it was like closing the door on the city. There was an accessible rooftop out the window with a big tree hanging over it. In the mornings, she would go to work and I'd venture out by myself and when I came back to the apartment, I'd know I was in the right place when I saw Village Cigars. I think it had been here forever even then. I was all out of photos this morning, so I took my camera to work, hoping that it wouldn't rain until after lunch. 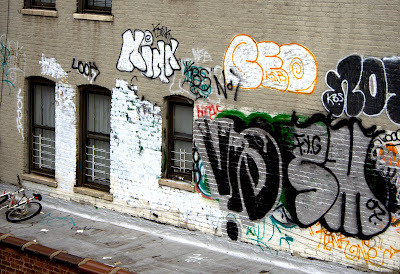 But in case it did, I took a few shots from the elevated subway platform at 215th Street. Those of you here in New York know that it did rain before, during and long after lunch today. Note: this is not street level - it's second story. Or maybe third. I'll check tomorrow. Oh, never mind, here's a shot to solve the question and orient you. Here's another shot that typifies Lexington Avenue to me. 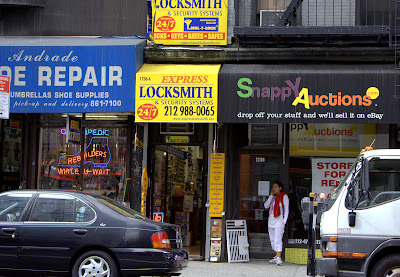 You got your shoe repair, your locksmith, your eBay drop off store. 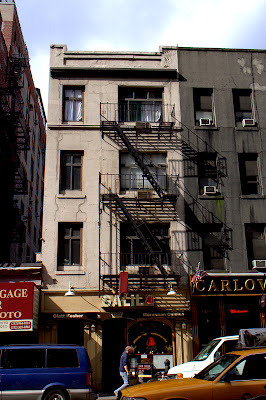 This is what Lexington Avenue looks like - with these old 4 story apartments with fire escapes and stores at street level. I've always liked the idea of living above the store. That's what's wrong with my apartment building in Inwood; there's no store at street level. Can't even get a cup of coffee without walking blocks. Might as well make it myself. Having discovered my mistake and reversed my direction, I've turned onto Lexington Avenue, heading downtown. This is a side view of The Lucida. 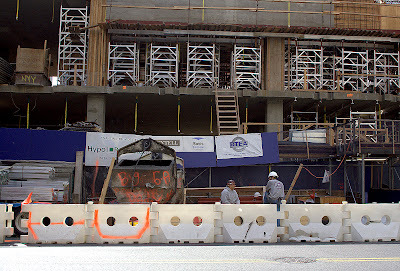 New York seems to be in the midst of a construction boom; I see this all over town. One of the sidewalk vendors I mentioned 2 nights ago. Now about these Raw files. 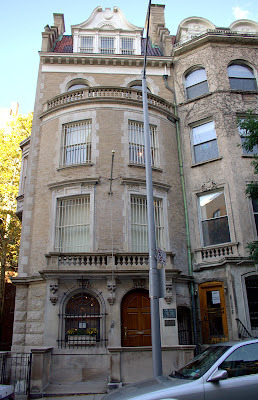 I have finally plunked down my $800 to take an Adobe Photoshop class at ICP (International Center for Photography), which is where I learned to print color film back when the class rooms were located on East 93rd Street. Or 92nd. Now it's time to get serious about this digital photography stuff. By the end of the class in December I should know how to print color digital. Of course, I can print them now on my color printer without taking a class, but I want to do it the hard way. All you people who have been clamoring for a print will soon be able to get one. Actually, I owe one for last year's Christmas present. It's coming soon! 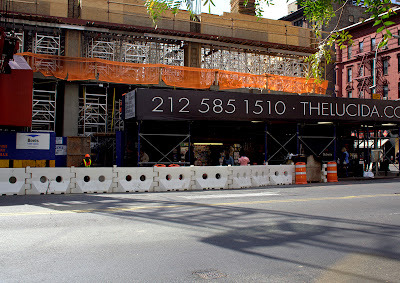 Farther down the block, The Lucida construction continues. I used to get all upset when Blogger wouldn't let me post my photo, but now I just gracefully give up. Oh, well, I say. I'll try again first thing in the morning. On Monday I went for a lunchtime photowalk for the purpose of getting some Raw shots for my Photoshop class for Digital Imaging. You're looking at the first Raw shot I've posted. Time for some self-respect here. More about all this later. I took the No. 6 subway to 86th Street and walked down Lexington Avenue to the 77th Street subway stop. First, however, I walked on 86th Street over to Third Avenue in the mistaken belief I was walking downtown. Bring on the compasses! This block was busy. On the south side, construction; on the north side lots of sidewalk vendors and people; it reminded me of 125th Street in Harlem. I googled The Lucida, not expecting much, but look what's going in there! Does it seem a tad out of place? We'll see how long the sidewalk vendors last after that place opens. There's nothing like getting home at 2:30 a.m. and posting to your photoblog and trying to come up with something pithy or pissy to say about it or anything at all. Let's see. This is the last shot of this October 5th walk. It was taken after the doctor visit, after taking my new prescription to the drug store, after having an expensive and enjoyable lunch at Circus while waiting for prescription to be filled, and then waiting at the traffic light to go back to the drug store on Lexington. Where I was tonight was the Metropolitan Opera to see The Marriage of Figaro, very good, the Countess especially good, the production pale and sun filled. And afterwards a nightcap at Fiorellos with conversation about how weird things are and getting old; you can probably see how the subjects are related. 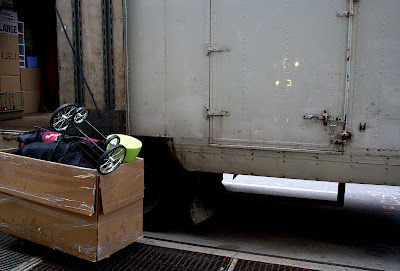 I wanted to show you a photograph of Bergdorf Goodman's Men's Store across the street from the main store on Fifth Avenue, but this awful, intrusive truck was in the way. ha ha ha ha ha! Isn't it gorgeous? Time for some color! We haven't had any since the flowered taxi post a week ago. That's F A O Schwartz, the famous toy store. The buillding on the right with the sloping facade is the north side of Sheldon Solow's building known as 9 West 57th Steet and built in 1974. For the pros and cons of sloping facades, and more photos, check this out. This is across the street from the Plaza Hotel. 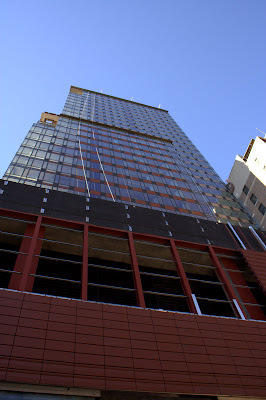 This is the side of the Plaza Hotel where much work is taking place. I confess I haven't kept up with the Plaza, and on a first pass, the most current information I could find was from 2005. But you might want to take a look at the National Trust Historic Preservation site anyway, which is pretty interesting. If you're interested in that sort of thing. I have grown to love Subway sandwich shops and keep my eye out for them; they are so photogenic. In fact, I'm going to start a label (tag) for them. You may not believe that this is a photograph of a Subway shop, but just hold your thumb over the sign so as to block it out and you will see that it is more important than the guy in the striped shirt or even more important than the truck. Please enlarge first. Looking at this photo starts me thinking about how I would paint it. Big. And very abstract. And definitely include the green and red plastic rings. I must say, the last couple of days have been thrilling indeed. The NY Times City Room Blog and Gawker.com both picked up my Monday post and I got 1,300 hits in one day. That's the big time for me, folks, and I'll likely not see that again; in fact, I'm nowhere near that number today. Many comments on Gawker and they came with their knives sharpened. Pretty funny. And thank you, those of you who commented on this blog, yes, even anonymous. I was very glad to hear from you all. More shots of adorable truck. On the other hand, here is a truck to love. 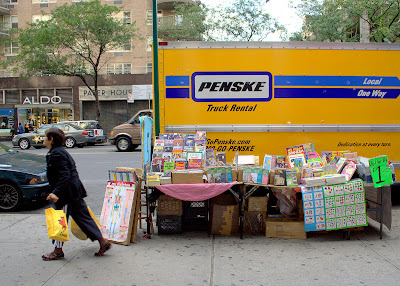 Cy Twombly was probably inspired by this very truck. Now, seriously, to revisit last night's comments, if you really care about children's happiness and creative growth, wouldn't you let them paint their own paintings on taxis instead of filling in someone else's blanks? And wouldn't it look great? And wouldn't it be true to New York? I get excited every time I think about it. Back to this truck. I truly fell in love with it, and tomorrow night I'm going to show you multiple shots of it, including the other side. Tonight I needed one shot to Make a Statement. It's an outrage! The first time I saw one of these taxis, I smiled and shook my head, as in, you see such amazing things on the streets of New York. But I kept seeing more and more of them, and, while it is amusing to see your first one, seeing two or three on the same street is alarming, and the thought of all New York taxis being decorated with these kitschy flowers (see article) is horrifying. What's happening to us? Are we becoming Cute City? This is what comes of letting families live here. Why is it that New Yorkers never take these carriages? That's a rhetorical question; we all know it's because only tourists take them. I think I'm going to take one. Right after I take a pedicab. There's currently renewed controversy about allowing horses to do this in New York, since a few weeks ago a mare got spooked by loud music and crashed her carriage into a tree, injuring herself and dying from shock. Here's a link to the sad story, along with other accusations about bad working conditions for horses. Okay, a long, straight walk, though not as long as I had planned. Yesterday I had well over an hour between therapy and a doctor's appointment on the East side, so I thought I had plenty of time to walk 58th Street from Columbus Circle to the East River. One would think. But no. I guess my walking really, really slows down when I'm photographing. As Marty says in his Brooklyn accent, you're walking so slow, you're going backwards! I only made it to Park Avenue. Here at the beginning is a view of the wonderful Time Warner Building. We saw the back of it in October 2006. This is still Sunday, September 23. Before I met Luka for dinner, I walked around a block I needed. I'm tired of doing little bitty blocks. Finally tomorrow, I start a current and longer walk. But this one is nice, I think. In other news, the Fifth Annual Open House New York, or openhousenewyork, as they prefer to call it, takes place this weekend. Over 200 buildings in all five boroughs are open to the public, with tours and talks. Check out the website for details. Hello again. Had a lovely vacation, slept late every morning, cooked, ate, drank, gained 3 pounds, went to soccer games, admired my grandchildren, not to mention their parents and the airline didn't lose my bags. And the weather was good to great. This shot is from the Sunday evening before my trip, September 23. I was walking down the stairs to Broadway, all 110 of them, to get the subway. The important thing here is to know I'm looking down at and across Broadway.